No load speed (rpm) - 0 - 425 / 0 - 1700 Voltage (V) - 18 Battery pack capacity (Ah) - 5.0 Batter..
M28 Heavy Duty Angle Grinder Batteries - 2 x 3Ah Charger supplied - 60min No load speed - 9000r.. Battery capacity - 1.5ah No. of batteries supplied - 1 Charger supplied - 30min Display size - 60.. Battery capacity - 1.5Ah No of batteries supplied - 1 Charger supplied - 30 min Display size - 68..
No load speed (rpm) - 0 - 1200 / 0 - 1700 Voltage (V) - 18 Battery pack capacity (Ah) - 5.0 Batte.. The machine is intended for hammer drilling in concrete, brick and stone. It is also suitable for dr.. Battery = 2 x 14.4 V 2.6 Ah Ni-Mh Torque = 38Nm Rpm = 1st 0-400 / 2nd 0-1400 Chuck = 10mm Keyless.. The shortest 18V long-distance runner with impact drilling function and Compact battery Max Torque ..
2 x 1.5ah Batteries Included. 30 minute battery charge time Fuel gauge displays remaining battery ..
No. of batteries supplied - 2 Charger supplied - 40 min No load speed - 0-2450rpm Tool reception .. Battery capacity - 2ah No of batteries supplied - 2 Charger supplied - 40 min No load stroke rate..
Cordless 18V SDS Drill 4ah "Brushless Motor"
Long runtime (153 holes, 6 x 40 mm in concrete) with one battery charge (4.0 Ah) thanks to efficient.. Battery capacity - 4Ah No. of batteries supplied - 2 Charger supplied - 80min No load speed - 0-8.. Battery capacity - 1.5ah No. of batteries supplied - 1 Charger supplied - 30min Display size - 68.. Durable, Waterproof, Dustproof. Imager for use in almost any Enviroment 90 deg Image Rotation for .. Battery pack capacity - 2Ah No. of batteries supplied - 2 Charger supplied - 40 min No load speed..
No load speed - 0-2500rpm Impact rate - 0-3300ipm Tool reception - 1/4" Hex Max torque - 112Nm ..
Voltage - 12 V Max. light output - 400 Lumens Beam distance - 23 mtrs No. of Batteries sullplied ..
Max drill bit diameter - 4-16mm Max drilling depth - 120mm Supplied in - Kitbox Fits all Milwau.. Batteries - 2 x 2Ah No. of Batteries - 2 Charger - 40min No Load Speed - 0-2000 / 0-2750rpm Impa.. Battery capacity - 2ah No. of batteries supplied - 1 Charger supplied - 40 min Max pushing force .. Batteries - 2 x 2Ah Charger supplied - 40min No load speed gear 1 - 0-500rpm No load speed gear 2.. Battery pack capacity - 2ah No. of batteries supplied - 2 Charger supplied - 40min No load speed .. Batteries - 2 x 4ah Li-ion Charger Supplied - 80 min Stroke Rate - 0 - 3000spm Stroke length - 20..
M18 Fuel Compact Percussion Drill Batteries - 2 x 4Ah Charger supplied - 80min No load speed gear.. Battery pack capacity - 4ah No. of batteries supplied - 2 Charger supplied - 80min No load speed .. Battery pack capacity - 4ah No. of batteries supplied - 2 Charger supplied - 80min Tool reception..
No. 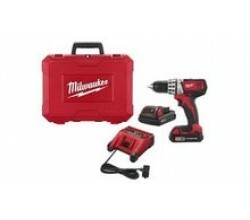 of batteries supplied - 0 Tool reception - SDS Plus Blow energy - 1.2 J Max drilling wood - 1.. Battery pack capacity - 4Ah No. of batteries supplied - 2 Charger supplied - 80 min No load speed..
No load speed - 8500rpm Disc diameter - 115mm Tool reception - 1/2" square Cutting depth - 28mm .. Kit Includes: M18CPD - Body Only M18CIW12 - Body Only Batteries - 2 x 4Ah Charger - 80min Sup.. Kit Includes: M18CPD - Body Only M18CID - Body Only Batteries - 2 x 4Ah Charger - 80min Suppl.. Batteries - 2 x 4ah Li-ion Charger Supplied - 80 min Stroke Rate - 0 - 3000spm Stroke length - 28..
Stroke Rate - 0 - 3000spm Stroke length - 28.6mm Milwaukee designed and built brushless powersta.. Pack Includes: 1 x M18 Sawzall (body only) 1 x M18 Angle Grinder (body only) 1 x M18 Circular S.. Battery Pack - 3Ah No. of Batteries Supplied - 1 Charger Supplied - 60 min No Load Speed - 0-1500..
No Load Speed - 0-1500rpm Chuck Capacity - 10mm Max Torque - 20Nm Max Drilling Wood - 28mm Max D..
M18 Compact 3 Mode SDS Hammer Drill Battery - 2 x 4Ah Charger - 80 min Tool reception - SDS plus ..
Rate of Air Flow - 1246 l/min Vacuum - 80mbar Capacity Container - 9.79 L Solid - ..
Four piece Milwaukee 12Volt set. Contains M12BDD, M12BID, C12HZ, M12TLED, 2 X 12V 2.0Ah batterie..
28V high power motor provides corded tool performance. Rotary only mode for drilling in wood and & .. Battery = 2 x 4 V - 3 Ah Lithium-ion Chuck = 1/4" Hex Torque = 7 Settings.. Battery Pack Capacity - 4Ah No. of Batteries Supplied - 2 Charger Supplied - 80 min No Load Strok..
No Load Stroke Rate - 2050 / 2700 spm Max Cutting Capacity Wood - 120mm Max Cutting Capacity Steel..